In its manifesto for the 2014 elections, the BJP had promised that the government would "facilitate piped water to all households"
The BJP in its manifesto for the general elections has announced that, if elected back to power, it would launch a ‘Jal Jivan Mission’, under which it will introduce a special programme, ‘Nal se Jal’, to ensure piped water for every household by 2024. 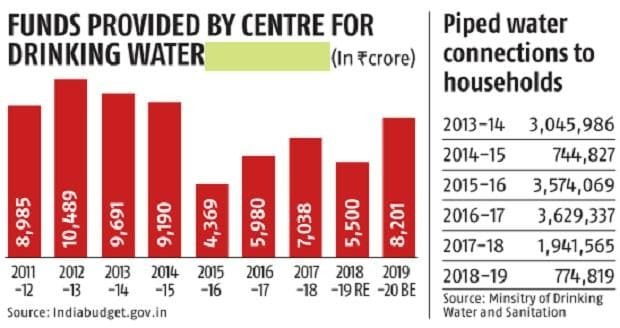 Data from the Union government shows, in the last five years of the NDA government, the highest number of piped water connections provided in a single year was 3.6 million. In order to meet the target that the BJP has promised in its 2019 manifesto, the Union government would have to provide more than 36.5 million connections on an average in a year. 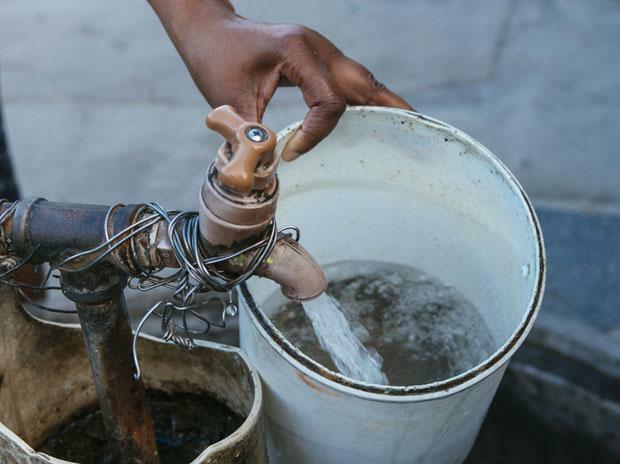 At the moment, only 32.57 million (18.24 per cent) of the 178.54 million households have piped water connections. In its manifesto for the 2014 elections, the BJP had promised that the government would “facilitate piped water to all households”. Since 2009, different governments have attempted to provide drinking water to people through the National Drinking Water Mission, launched in 2009 and revised in 2012. Coming into power in 2014, the NDA government continued with the scheme, though it made substantial alterations in 2015. The alteration came along with a 60 per cent reduction in the fund allocation for rural drinking water over its peak year funding in 2012-13, when Rs 10,489 crore was spent on the scheme. In comparison, in 2015-16, the government spent only Rs 4,369 crore on supplying drinking water to rural habitations. The NDA government began marginal improvement in funding support for the next two years by 37 per cent and 18 per cent over previous years, but in the last financial year, funding support to drinking water supply dried up again, reducing by 22 per cent. The revised expenditure of the Union government on providing drinking water supply came down to Rs 5,500 crore. This downward trend looks bleaker when one compares these numbers to the size of the overall budget. A CAG report on the drinking water mission presented in March 2018 and covering the period between 2012-17 notes several failures in implementing the scheme, leading to below par performance in terms of households and habitations provided drinking water. The scheme is co-funded by states and the CAG report showed the states too had a varying performance in how they funded it as well as how efficiently the money was spent. Under the scheme, till date, piped water was only one ways to provide drinking water. Ground-water remains the biggest source of drinking water with the government scheme also providing hand-pumps, borewells and other routes of supply. Shifting entirely to piped water would require leapfrogging in terms of capacity, investment and design of the programme. He pointed out that in a strategic plan drawn up in 2011-12 to enhance piped water delivery to 90% of the population by 2021-22, the government had then estimated that the total investment required by Centre and states would be Rs 3.2 lakh crores at 2011 prices. The costs, he noted would be substantially higher on nominal terms and would vary depending on what standards are set for minimum water to be supplied.